Lest you think I have finally lost all sense of time now that I don’t sit in a cubicle anymore, I promise that I know it’s Friday morning, and not Sunday afternoon. I’d like to say there’s some bright and clever story behind the Sunday afternoon cake love series, but the truth is pretty prosaic. I’d had the idea last Sunday to write a big ol’post about cake, and include three recipes, one for the Roland Mesnier applesauce cake, one for the pistachio-nougat torte I made for Julie’s birthday party the previous week, and one for the famous Elizabeth David flourless chocolate cake that inspired so much conversation around here. Alas, I’d had this brilliant idea at about the same time I’d had the idea to start experimenting with the pain brié that I hadn’t made since culinary school. Two hours later, I had only got as far as the applesauce cake; the pain brié starter was overfermented, the resulting dough was overfloured and sharp-smelling, and I was filled with the vague sense of guilty self-loathing that always comes with not planning well. (Confidential to e: Yes, I seem to remember promising something about no more self-loathing. Hey, these things take time. You can’t just jump into ‘em.) That was the moment where I decided that Sunday afternoon cake love would make a super three-part series. I know I’m breaking at least one heart by not posting the pistachio nougat torte recipe this morning, but in my infinite genius, I forgot to take a picture of the one I’d made for Julie’s party. (In my defense, I had also made a pair of Trianons for the same party; by the time I finished the finishing on the torte, I was a little addled, to say nothing of sticky and cream-covered. This was not nearly as attractive as it sounds. Give it up, already, you perverts.) Fortunately, it’s easy to put together and will keep in the freezer (although the original recipe doesn’t specifically recommend this). The only thing keeping me from making it right now is an insufficient supply of pistachios, but a quick trip to the Greek supermarket around the corner will fix that sharpish. In the meantime, I do have the fixings for the Elizabeth David cake. I made the one in the photograph on Tuesday afternoon. Lloyd and I finally killed it last night. It took everything in me not to make one for breakfast, but even I have my limits. Note: As is the standard operating procedure around here, the recipe is Mrs. David’s, but her instructions are rewritten in my own words. I have also changed the methodology a bit, most ly by adding some of the sugar to the egg whites during the beating process. Set a rack in the center of the oven and preheat the oven to 300F/135C/Gas Mark 2. Butter an 8-inch springform or loose-bottomed cake pan (which is what I used). Melt the chocolate, vanilla, coffee and brandy together in a double boiler. If you have a heavy saucepan, you can heat it right in the pan as long as you keep the heat low. Stir everything together gently. The liquids may cause the chocolate to seize up a bit. This is nothing to worry about; it will all smooth out once you blend everything together. Add the butter, sugar, salt and ground almonds. Stir together until the butter is melted. Remove the pan from the heat. In a medium bowl, beat the egg yolks until they are lightened in color ("lemon-colored," in Laurie Colwin’s words). It’s fine to do this by hand with a small whisk. Add the beaten yolks to the chocolate mixture. Using either a hand mixer or a stand mixer fitted with the whisk attachment, beat the egg whites. Begin by beating them slowly while simultaneously adding, slowly, the tablespoon of sugar you held back from the rest. Once the sugar has been added, turn the motor to high and beat the egg whites until they just hold stiff peaks. Take a spoonful of the egg whites and stir them into the chocolate mixture to lighten it a bit. Fold in the rest of the egg whites gently. Turn the batter into the prepared pan. Bake the cake for 45 minutes. When it is done, it will be slightly risen (but will sink back down upon cooling) and dry to the touch, but a cake tester will not emerge cleanly. 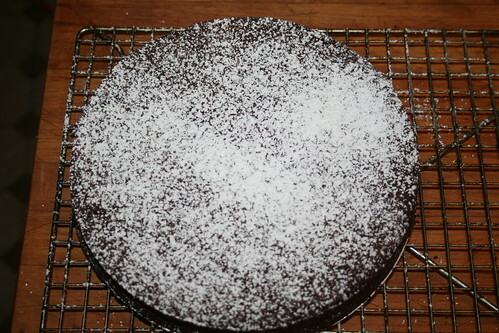 Cool on a rack; remove the side of the pan once the cake is thoroughly cooled.